The Daleks are the Doctors most iconic enemies. It could be argued that the image of a Dalek is far more iconic than that of any incarnation of the Doctor himself. Not surprisingly over the years many have wondered if the monsters could actually have a life outside of the show that spawned them. Back in the 1960’s Terry Nation the creator of the Daleks tried to get a Dalek spin off series made. At one point even tried to sell the series to America. This was why the creatures vanished from Doctor Who for 5 years from 1966 to 1972. Sadly Nation’s attempts to launch the creatures in their own series was ultimately a failure. I raised a million dollars to privately make a picture. A spokesman for the BBC said they would become co-partners in the venture. I wrote the script.I came here to ABC, who expressed considerable interest in it. This is not to say they were making a commitment, but they were very interested. I went back and I started in to east and get a director and a designer. The designer started working, I booked the studio, and then my finance man went to conclude things with the BBC, and the man who had committed BBC for the other million bucks had no authority so to do, and suddenly my fifty percent backer was gone! The BBC actually didn’t have that – or the man that I had been dealing with did not have the power to do that. Whether he realized it or not I don’t know, but I then had to cancel the studio. It cost me personally a lot of money to pull that operation out. And I had a studio that was standing by, and I was going to be shooting in a weeks time – that’s how close we got when we lost the money – and I was not about to put up my own money, because its traditional that you never finance your own things. 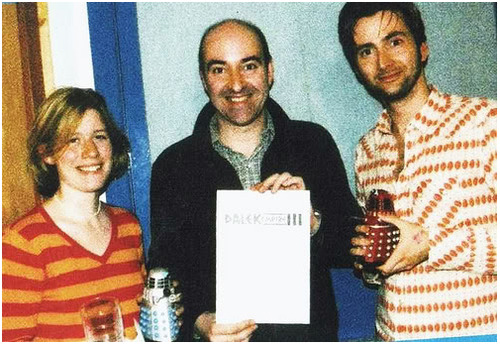 -Terry Nation on why the Dalek spin off series was never made. As you can see we came very close to having a Dalek spin off show. The series would have seen the SSS an organisation introduced in Nation’s Doctor Who story Mission to the Unknown battle the Daleks. The SSS were essentially MI5 in space. Mission to the Unknown and The Daleks Masterplan were meant to set up Nation’s Dalek series. Not only did they introduce the SSS, but also Sara Kingdom played by Jean Marsh who despite dying at the end of The Daleks Masterplan would have been the main character in the Daleks spin off series. Among the other main characters in the series would have been David Kingdom her brother and Mark Seven a humanoid android been based on the Mr Spock character from Star Trek. Whilst Nation’s show was never made, many decades later the Daleks would get their own series when Nicholas Briggs the voice of the Daleks in the revival produced the Dalek Empire spin off audio series. David Tennant who played the Tenth Doctor actually appeared in this series as one of the main characters prior to landing the role of the Doctor. Noel Clarke who played Mickey Smith also appeared in the series too. Apparently whilst working on this series Nicholas Briggs told his friend Tennant that he should audition for the role of the 10th Doctor unaware that he had already got it! In addition to this Briggs would also later produce the unfinished script for the pilot episode of Nation’s Dalek series, with Jean Marsh who played Sara in The Daleks Masterplan even reprising her role as Sara Kingdom. As you can see from the examples I have given the monsters have already through Nicholas Briggs Dalek Empire series proven strong enough to carry their own series. So its not such an outlandish idea it can in the right hands of course be done. Personally I think now is the best time to make a series all about the monsters and hopefully after reading you may agree with me. During the late 00’s Doctor Who was more than just a popular series it was a massive franchise. There was always something DW related on during the year and for all age groups too. In 2008 for instance you had Torchwood on in the winter for adults, Doctor Who across the spring and summer for the whole family, and finally the Sarah Jane Adventures in the Autumn just for children. All three of these series during this time were very popular too. Sadly the Doctor Who franchise came to an end in the early 10’s due to a number of real life behind the scenes tragedies. Elizabeth Sladen who played Sarah Jane passed away in 2011, whilst Russell T Davies’s partner Andrew Smith was diagnosed with brain cancer, forcing Davies to return from America, which consequently brought an end to Torchwood. Since then the Doctor Who universe’s output has naturally decreased to just one series, until recently when it was announced that a new spin off titled Class set within Coal Hill School would be produced. 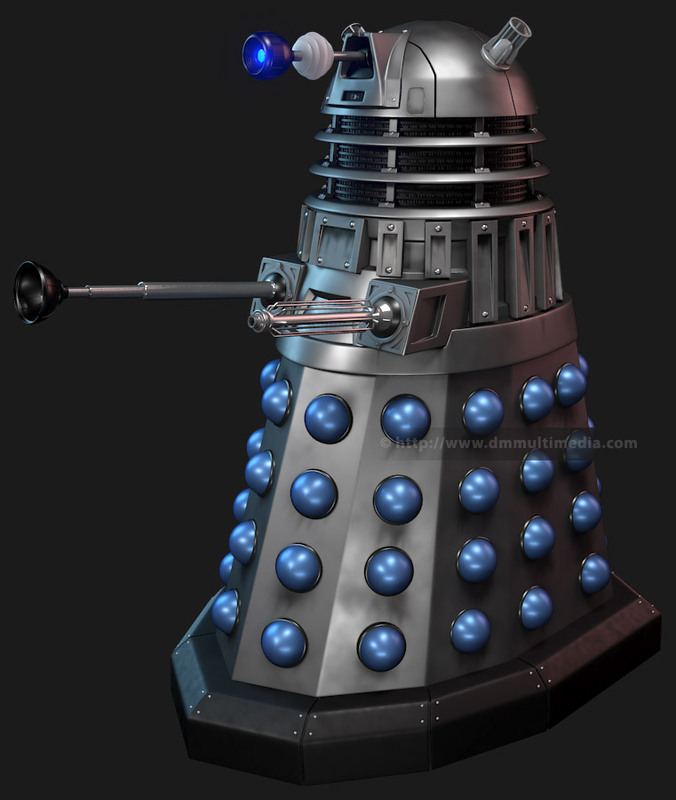 I think a Dalek spin off in addition to Class could help restore Who to the position it was in during the late 00’s, as a full franchise which would obviously be a good thing all around. Two spin off series I think would really boost its profile as these two shows could help draw new audiences to the show, as they both would be brand new and people who may not have wanted to watch Doctor Who could become more interested in it after becoming fans of the spin off. Now as Class is going to be aimed at a teenage audience then I think that the Dalek spin off should be aimed at a more adult audience like Torchwood was. This I think would allow the writers to do things with the Daleks that they couldn’t really do in Doctor Who. Doctor Who is not a kids show. It is aimed at a family audience, however whilst it is not exclusively for children, at the same time it is something that children obviously do watch and thus it can’t be too violent or scary. Giving us a Dalek spin off series that was aimed mostly at adults could allow the Daleks to do far more horrible things than in Doctor Who. We could really show them as space Nazi’s like never before which I think could help to restore a lot of their menace. We could really see the gory details of the Dalek death camps in a way that we never could in Doctor Who for instance. We could see piles of the Daleks victims corpses just left to rot that would evoke similar terrifying images from the second world war of the Nazi’s victims in the concentration camps. There are a few unanswered questions about the Daleks in the revival. Like for instance what happened to the paradigm? How did Davros survive the destruction of the crucible? A spin off series could give us the answers to these questions. We could get an episode that revealed that after the destruction of the crucible Davros managed to create another race of Daleks that destroyed the paradigm, and we could even have the main characters be forced to form a reluctant alliance with the paradigm Daleks to destroy Davros’s new race. This series could even serve as something of a prequel to The Magician’s Apprentice as we could see Davros get injured by the Paradigm Daleks. There are so many Dalek related and Dalek characters that could pop up in this series or be the main characters. Looking at Dalek characters we have the Cult of Skaro, Dalek Sec, Dalek Caan, Dalek Thay and Dalek Jaast. Now I know what you are thinking that they all died so we can’t have them back. Well we could always go back to before they died. Maybe even show an origin story for them that could be quite interesting. Or we could perhaps have clones of them appear. Maybe Davros sent a squad of Daleks to retrieve their corpses from the black archive. That’s where I reckon they ended up and he produced clones of them. I think that the Cult would be good antagonists for the main characters in the series as they are Daleks but you could give them more of a personality as we saw already with Sec’s cutting remarks to the Cybermen. At the same time we could also have the Dalek Time Controller, a very popular Dalek character from the Big Finish Dark Eyes series appear as a recurring antagonist. Dalek Zeg is another Dalek character that could be interesting. He came from the Dalek Chronicles comic book series and was a Dalek who had become mutated after an accident in a lab. His mutation made him virtually indestructable and he sought to take control of the Daleks from the Emperor himself. I think it would be interesting to have a Dalek who was a complete rogue, wasn’t aligned to any other Daleks just simply looking out for himself and was perhaps a bit unstable. Think of what Nicholas Briggs could do with that Daleks voice! Dalek X the Dalek that loves to torture people would be a great Dalek to feature in the series. I’d love to see an episode that revolved around his death camps. You could also bring the Emperor who hasn’t been featured on tv since The Parting of the Ways 10 years ago back as well. On the other side of the spectrum we could have some more benevolent Dalek characters too. 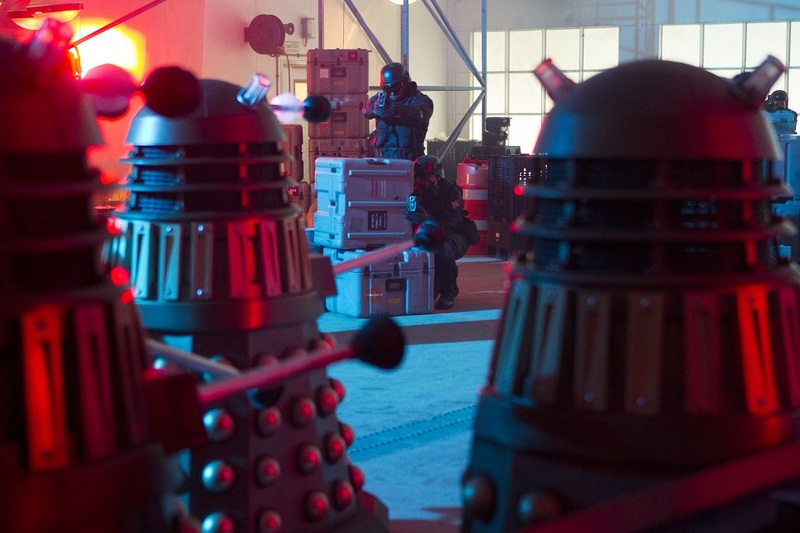 We could have the Oswin Dalek appear in the series. Again even though she apparently died, we could always have it that she survived somehow. Maybe she found another teleportation device and teleported up to the ship or to a nearby planet. I think a Dalek that was once human would be an interesting idea. We’d see a character that still had human emotions and feelings but was trapped in a cold metal cage as a freak forever. We could also explore more of her past before she became a Dalek too. I would also like to see Rusty in this series too. Rusty would be a different type of good guy Dalek to Oswin as he would be one full of rage and hatred for the Daleks. 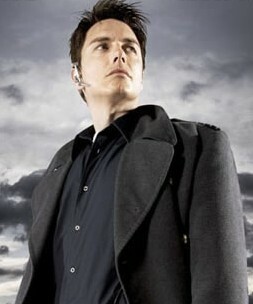 If he met Oswin he would even try and kill her. There are plenty of human characters that could be interesting too. Journey Blue would be an interesting character to have in the series. Journey Blue would have to be the lead character. Absolam Daak meanwhile a character from the expanded universe would also be an excellent character to appear in the series as well. He and Journey would be quite a good two to put together as he is lowlife, criminal who kills Daleks for fun, whilst she is a very serious, dedicated and honourable soldier. At the same time we could have plenty of Whoniverse characters who have not been associated with the Daleks. For instance Psi and Saibra. Those two characters who appeared in Time Heist last year proved to be very popular. So much so that many people have called for them to be the next companions. Personally I’d rather see them as regulars in the Dalek series. According to Time Heist they come from round about the same time as Absolam Daak as he appeared among the list of greatest criminals in that episode. You could also have guest appearances from Jack and even River Song too as they are after all time travellers. I’d also like to see Mark Seven appear in the series. It would be nice to finally realise Nation’s somewhat odd creation and through him we could find out more about the SSS who I felt were a somewhat interesting creation. Then of course finally there is Davros who could appear too. Its always a good thing to have Julian Bleach reprise his role as Davros. As you can see there is a lot of mileage in a Dalek spin off series. I hope that the BBC decides to make this the second spin off for Moffat era Who after Class or third if we ever get that Paternoster Gang spin off.